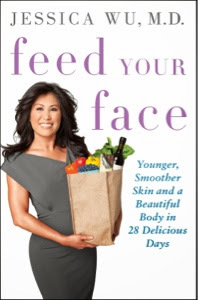 It's Chelsea: Feed your face. Over the past few years, I have become very conscious of how my skin looks and how to improve it. I've had quite problematic skin which has lead to some scarring that I'm still trying to get rid of, or reduce in appearance. Ultimately, my goal is to have flawless skin such that foundation/bb cream will no longer be a part of my daily routine. As you can probably tell from the beauty industry, you can spend hundreds of pounds on lotions and potions that claim to make scars "disappear" or even out skin tone etc. I'm not saying that these products don't work, but if you combine them with a healthy diet, you may see quicker results. I can't remember how I stumbled across this book but if you are interested in skincare and healthy eating, give this a try! I bought mine on Amazon. It covers a lot of topics that range from how to reduce sun damage to how to minimise acne with the power of food. Being a dermatologist herself and treating A list patients, I'm hoping her words and opinions can be trusted? She also has a 28 day diet plan that claims to improve the look and feel of your skin AND banish blemishes (!!!) which I have yet to try. Let me know if this worked for you if you've tried this!